Firstly traditional social democratic parties, which dominated European politics until recently, are struggling – to the point that ​“spectre haunting Europe”, say many academics, is one of ​“the lost [social democratic] left”. 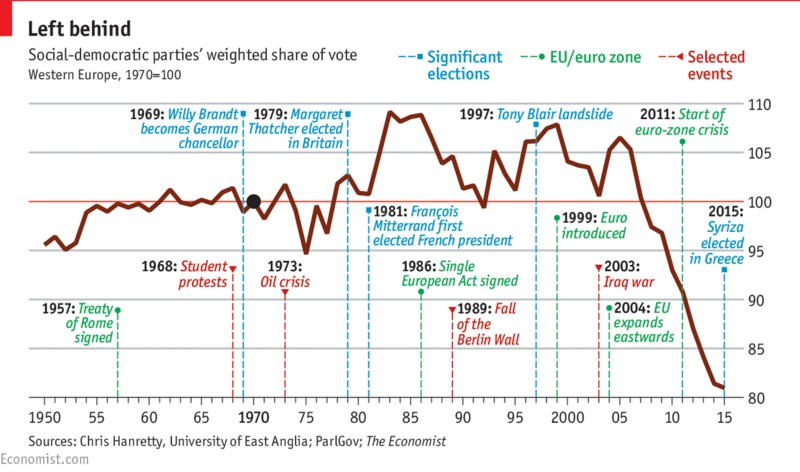 Secondly, far right movements are on this rise in many countries – promoting Euroscepticism, nationalism and xenophobia. Thirdly, some political movements on the left of traditional social democracy have managed to capitalise on discontent with post-2008 economic policy — sometimes to the point of competing par on par with the centre-left. 2017 will see several major electoral battles. Far from reversing post-2008 trends the next 12 months will reinforce the first and the second shifts. In 2012, Francois Hollande — leader of the French Socialist Party (PSF) – won the presidential elections on a mild anti-austerity agenda, promising to redistribute wealth and change a number of European treaties and policies in a pro-growth direction. What he delivered ended up hardly discernible from any typical centre-right agenda, and he failed to steer the Eurozone in a more progressive direction. Hollande will end his term as the least popular French President since the establishment of the Fifth Republic in 1958. Hollande will not run again, and despite the election of a vocal anti-austerity leader at the head of the Socialist Party — Benoit Hamon — current polls predict that he will not make it to the second round of the 2017 Presidential elections. Instead, the contest is likely to pit Marine Le Pen – a far right candidate advocating for immigration controls, protectionist economic policies and a French exit from the Eurozone – against either Francois Fillon, a centre right candidate running on a die-hard neoliberal platform, or Emmanuel Macron, the architect of France’s liberalisation agenda from 2014 to 2016. Based on current polls, Le Pen is ultimately unlikely to beat Fillon or Macron in the second round – but polls repeatedly got it wrong in 2016. Germany is currently governed by a coalition between the centre-right (CDU/​CSU) and centre left (SPD) – dominated by the former both in electoral terms and ministerial representation. Angela Merkel, leader of the centre-right CDU, has occupied the position of Chancellor since 2005 and will stand for a fourth term. Based on current polls, the centre right will remain the largest political force. But it is polling about 30 – 35% and unlikely to reach the absolute majority (50%) needed to form a government. The once dominant German Socialist Party (SPD) is still in a deep crisis, having never recovered from its adoption of Gerhard Schroder’s Neue Mitte policies — Germany’s version of New Labour’s Third Way. These included socially regressive labour and welfare legislation, which decimated the SPD’s membership and support in the early 2000s. To this date, the SPD has failed to capitalise on popular discontent with widening inequality and precarious work. With only 20% of people intending to vote SPD, it is set to match some of the worst scores of its history – unless its new leader, Martin Schultz, manages to turn the situation around. Attempts to form an electoral coalition between the SPD, the left-wing Die Linke and the Green Party could potentially topple the centre right. But if current polls are correct, the most likely outcome is a new Merkel-led ​“grand coalition” between the centre right and the centre left. The biggest shock in German politics is likely to be the score of the AfD (Alternative für Deutschland) an anti-immigration and eurosceptic far right party – currently polling at about 15%, it is set to become the first far right party to gain representation in the Bundestag since 1945. Likely outcome? Far right may come first but won’t manage to get enough allies for forming a government; centre-right to lead the formation of a new coalition government. The Netherlands are currently governed by a coalition between the conservative VVD party of Mark Rutte and the Dutch Labour Party (PvdA). The Labour Party’s collapse in the polls (it is forecast to go from 38 to just 11 MPs) — due to austerity measures taken under its watch since 2012 — means that this coalition is unlikely to repeat. The far right PVV (Freedom Party) of Geert Wilders is currently toping the polls – with an anti-immigration, anti-Islam and Eurosceptic agenda. Wilders has promised a referendum on membership to the EU if he is elected. His main rival is the party of the current Prime Minister, Mark Rutte. The fragmented nature of the Dutch political system means that a coalition between the right wing VVD party of Rutte and other centrist parties would manage to block a Freedom Party-led government – and this is the most likely scenario. However, a first place for the Freedom Party would give an impetus to far right populist movements across Europe. While support for traditional social democracy is ebbing across Europe, the debate is progressively being shaped – on the one hand by centre right forces that are doubling down on the neoliberal status quo; and on the other by far right forces that are advocating for an aggressive retreat to the nation-State. Neither of those movements can steer the Eurozone and the EU out of the current crisis. The neoliberal status quo means permanent austerity, high unemployment, environmental degradation and the constant bailout of zombie banks. And the agenda of far right populism would wipe out fifty years of European integration – spurring regressive nationalism across the Old Continent. Europe needs political movements that can take us beyond this false dilemma: movements which are both willing to challenge the neoliberal status quo while rejecting the idea that Europe’s woes can be solved through nationalism. In Spain for example, where the far-right has failed to make a foothold, Podemos have started this work. And in Portugal, a coalition united on an anti-austerity agenda managed to win the 2016 parliamentary elections. The European project urgently needs to be democratically redesigned, on a basis of shared socio-economic justice and ecological sustainability.